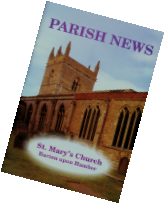 Saint Mary's Parish magazine Parish News is published monthly. To submit material to the Editor,click here. Archived here are past issues of Saint Mary's Parish magazine Parish News. Last updated 23 January 2019.